European extreme right-wing parties try to unite just another time. This time around it is the Austrian “Freedom Party”, the Dutch “PVV” of Wilders, the Flemish “Vlaams Belang”, French “Front National”, the Italian “Lega Nord”, and the “Swedish Democrats” that might unite under one umbrella. It is just another attempt that racist and backward anti-EU movements want to become one force to stop European integration. Parties from at least seven countries with at least 25 Members of European Parliament (MEPs) out of the 751 potential seats need to be gained in order to create a political party group in the European Parliament in May 2014. The potential alliance of right-extremists therefore needs an alliance with a broad basis that unites on euro-skepticism and particularly on issues of racism, anti-Semitism or Islamophobia. Potentially, the newly formed “Alternative für Deutschland” (AfD) in Germany could be a partner, although this EU-skeptical movement has distanced itself so far from right-extremist parties. And yet, AfDs statements on the EU very much go along with the other right-wing parties. Other parties could be the British “Tories” or the “UK Independence Party” as both would like that the UK would leave the EU as soon as possible. However, these two parties do not want to be linked to the kind of racism that the other parties ultimately would stand for. On the other side, other candidates for such an alliance could be too extreme for more traditional right-wing populists, including the “British National Party”, the Hungarian “Jobbik” or the Greek “Golden Dawn”. Euro-skeptics could get a lot of votes at the next European Parliament elections, probably more than ever beforehand. European elections always have its specifics in each and every member state. Thus, it is hard to predict any outcome about half a year before the elections are going to take place. However, opinion polls suggest that some parties could make a lot of gains in the European Parliament, like Front National which topped a poll in France in October with 24%. Also the PVV is ahead in the Netherlands and in the UK, UKIP is with 11% even ahead of the established LibDems. 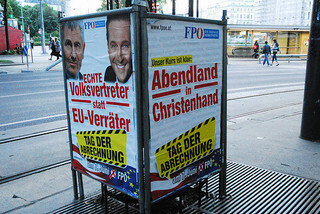 Also Austria’s Freedom Party most likely will gain ground because of the euro-skeptic population there. At the moment, there are around 100 right-wing MEPs in the European Parliament (“European Conservatives and Reformists (ECR),” “Europe of Freedom and Democracy (EFD)” and some independent MEPs) who are actually against the EU to quite a large degree in addition to the EU-skeptical leftist political group “European United Left–Nordic Green Left (GUE-NGL)” with 35 MEPs. Instead of reforming the EU, they mostly suggest either leaving or dissolving the union and create a Europe of Nations with less instead of more integration. It could be indeed dangerous if this block is further on the rise to make politics that is sensitive and will move the union further. I have seen it myself that these MEPs are hardly active in the committee sessions, but all the more active to speak to their national media at home how bad and cruel the EU would be. And yet, a united club of anti-EU parties could fail just another time. Wilders might be too Islamophobic for Marine Le Pen who tries to get a more moderate image for her party ever since her father Jean-Marie Le Pen stepped down. At the same time Wilders is quite Israel-friendly which might be in turn problematic for other right-wing parties. Nonetheless is Guy Verhofstadt right when he states that “rising euro-skepticism must be a wake-up call for Europe.” If we just let it happen that right-extremists can destroy the European project, then it would be the failure for all of us who just sit on the sidelines. It is the same issues that need to change: more information on what the EU is doing – from youngsters to senior citizens, more media reporting about the work in the EU, particularly in the European Parliament, and the acknowledgement of national politicians that EU politics has become national politics. 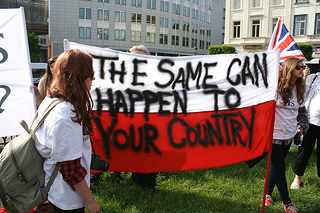 As long as the established parties in the respective member states do not seriously change their behavior towards the EU in how they communicate it to their citizens and do not send popular candidates that are somewhat known to the broader public to the European Parliament, the more likely it will be that right-extremists will gain ground. Update on 18/11/2013: It was announced during the day that the Slovakian National Party (SNS) would be the seventh party that the potential alliance is looking for. Pingback: Who will head the EU in 2015? | move — Wissen, wie Europa tickt.